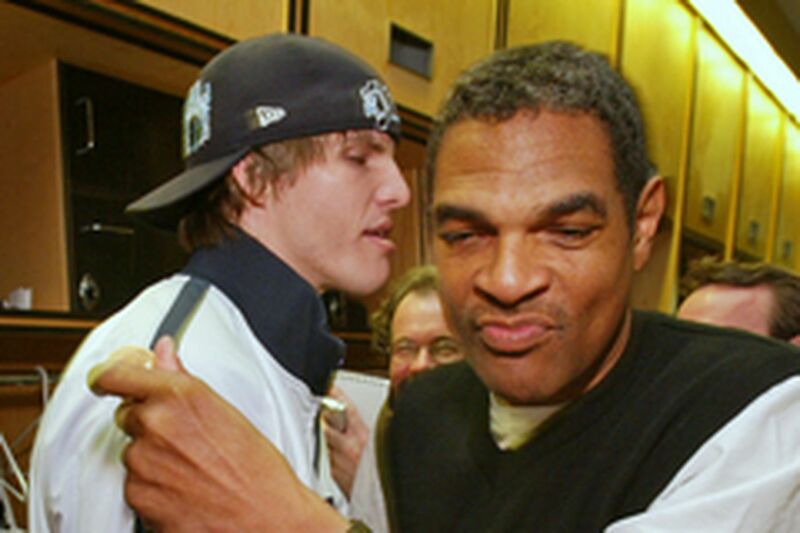 Kyle Korver, coach Maurice Cheeks say their goodbyes for summer. SO WHAT do you make of the 76ers? As they met for the last time as a team this season yesterday afternoon at the Wachovia Center, there were as many questions as answers. Was that strong finish in the homestretch a mirage in a league that was overrun by more tanks than Iraq? Did this team enjoy playing as much as it seemed after the trades? Is there enough here (with some help from the draft) to get this team into the playoffs next season? "I'm very excited about our young guys, about our team in general because our ceiling can be very high," coach Maurice Cheeks said. How high, the coach said, will depend on how the players approach the offseason. Whatever you think of the Sixers' finish, the reality is that they were five games out of the last playoff spot in a historically bad Eastern Conference. When they played well enough long enough to have a meaningful game, Orlando ran them out of the gym last Saturday. Cheeks chose to ignore that part of the season that came before the trade of Allen Iverson and release of Chris Webber. If you just evaluate what the Sixers became, you have to be encouraged, at least a bit. This was a team that was, for the most part, enjoyable to watch and clearly gave the effort needed to win in the league. However, anybody who thinks the Sixers are ready to go from out of the playoffs to contender simply does not stay up very late to watch much NBA basketball. What did change after the trades, Kyle Korver said, was the players' attitude in playing and practicing. "The chemistry [was better], not just the players, but coaches and players, the whole organization," Korver said. "We all felt like we all had to lean on each other." It was no longer about individuals, regardless of how accomplished. It was about team. "I don't think anyone in here really considers the whole season our actual season," Korver said. "I think we all kind of feel like, once the trades happened, that's when we kind of had our team . . . We didn't play championship-level basketball, but we played pretty solid basketball . . . I've never been so excited for the next year on this particular day as I am this year. In high school and college, it's always that I need a little break. I just don't feel like the season should be done yet." Believe it or not, it was only 6 years ago that the Sixers were on their way to the NBA Finals as one of the most beloved teams in Philadelphia sports history. Since then, they have won one playoff series, and that was four coaches ago (remember Larry Brown?). Finally, the Sixers decided to stop chasing that wonderful time and begin to look ahead. What happens next, of course, will depend upon the kinds of decisions made. The odds of the Sixers' winning the NBA lottery and getting the first pick are minuscule. But they will get something with those three first-round picks. They just have to make them count. The team must make a decision on Joe Smith, who was brought here with an expiring contract and showed he has some game left. A free agent, Smith made $6.807 million this season. He won't make that, but he will make something. Cheeks lobbied for Smith. "I'll put my two cents in there," the coach said. "Two cents is not going to get him back, but I'll put it in there." Smith, the former No. 1 draft choice from Maryland in 1995, has become an NBA nomad. He would not mind coming back. "I'd be definitely happy to be a part of it," Smith said. Right after the trade, Smith was looked at as a commodity that could free up some cap space. Now, he is looked at as a player again. "I think I've opened a few eyes as far as what I was hearing right after the trade about me just being an expiring contract," Smith said. Only in the Byzantine world of the NBA salary cap can a player now be known as an "expiring contract." Smith just wants a team to play for. "I get a lot of joy out of playing this game," Smith said. Meanwhile, do the Sixers make Andre Iguodala a significant offer when his rookie-signing window opens from July to October? "There would have been no way that I would have known he could be this type of a franchise player [until after the trades]," Cheeks said. Andre Miller was a revelation at point guard. He simply knows how to play. Unlike some NBA players, it is never about him. It is about his team, whatever team it might be. "I would [like to be back],'' said Miller, who is owed more than $19 million on the final 2 years of his contract. "I'm not going to worry about that right now. I'm under contract, so I'm not going to comment. Whatever decision the coaches and management make, I have to deal with." Even though he went from a playoff team (Denver) to a team that was a longshot even to get close to the playoffs, it never affected Miller's game. "There was no big egos, no hard heads," he said. "Guys just came to work and we played well off each other." Miller never took the trade or anything else personally. "It's a lot of fun being in the NBA, but this is also a business," Miller said. "You get judged on wins and losses."